3 Bean Quinoa Chili is a vegetarian chili that is hearty, delicious, and only needs one pot. It is naturally vegan, gluten-free, and very nutritious! I don’t care what the temperature reads in Fort Worth right now but I am ready for all things comforting, which means chili season is upon us. I make chili frequently all year long as it’s hearty, one-pot, and packs all the nutrients. My regular version is deliciously meaty but it’s time I add a vegetarian version to my repertoire hence, I present 3 Bean Quinoa Chili. I am partnering with Sprouts in #ChooseMyChili challenge as October is National Chili Month. 3 Bean Quinoa Chili is packed with plant-based protein, abundance of fiber, and naturally gluten-free & vegan. It is a perfect weeknight meal, great as leftover & for hosting chili night with friends and families too!! 3 Bean Quinoa Chili as the name suggests uses three different types of beans - kidney beans, pinto beans, and black beans. You can use dried beans (if you have time to soak and let it cook for about 1 hour to 1 hour 30 minutes), otherwise canned beans works like a charm and it's a lot quicker. If you are new to the world of dried beans, I highly suggest you to visit the bulk bin section at Sprouts as they have different varieties of grains, nuts, beans, and other items. Generally, buying items dried and in bulk is cheaper in the longer run and you can decide the amount you want to purchase instead of the whole bag. 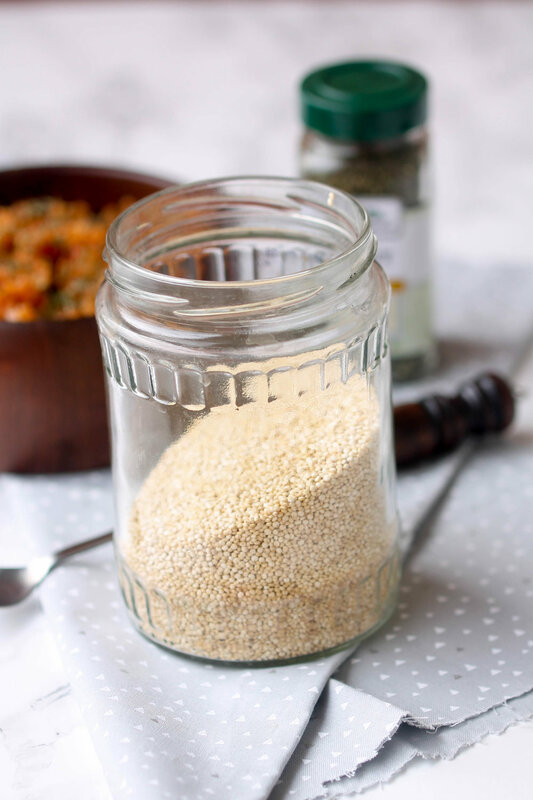 Quinoa, psuedo grain (it is actually a seed) is an important crop from mountainous regions of South America. Nutritionally speaking, it is a powerhouse for many nutrients including fiber, manganese, magnesium, phosphorus, lots of B-vitamins. It is well-renowned in plant-based community for its protein content (quinoa is a complete protein food with all the essential amino-acids. However, the idea of an absolute need for complete protein is obsolete and as long as you eat a variety of food everyday, there should be no problem getting all your essential amino acids) but it has many other nutrients and very versatile (psuedo) grain! In 3 Bean Quinoa Chili, quinoa adds such a nice texture breaking the monotony from beans and soaks up all the flavor too. If you are not a huge fan of quinoa in general, 3 Bean Quinoa Chili might just change your mind. PS. You can use quinoa for cookies & tomato mint quinoa (side dish). Here is a short, step by step video on how I made 3 Bean Quinoa Chili.. Using bean or tomatoes in Texas chili is a faux pas but I am love my bean + quinoa filled chili that is equally hearty and full of flavors from Simply Organics Vegetarian Chili Seasoning. Chili seasoning is a mix of different spices such as chili powder, cumin, oregano, garlic powder, cayenne pepper etc. If your spice rack isn't as stocked or you don't want to buy too many spices, Simply Organics Vegetarian Chili Seasoning is a great solution. I used the same chile seasoning for my tacos too and it was delicious. Like I mentioned, 3 Bean Quinoa Chili is naturally a gluten-free and vegan recipe. You can provide endless topping options such as cheese, sour cream, chopped onions, cilantro, sliced radish, cilantro, avocado slices etc while serving so the guest can assemble their own choice of 3 Bean Quinoa Chili. Keep things vegan or dairy-free by skipping cheese & sour cream but loading up on avocado & radish slices! I hope you will think about a vegetarian - 3 Bean Quinoa Chili next time you are looking for a one pot meal for a weeknight that is hearty & great for leftovers....or hosting a chili night with your loved ones. All the ingredients can be purchased at Sprouts including the Simple Organics vegetarian chili mix! The version I am sharing is a stove-top but I am sure you can follow the same recipe for 3 Bean Quinoa Chili but adjust the timing if you use a slow cooker or an Instant Pot. If you end up making 3 Bean Quinoa Chili using a slow cooker or an Instant Pot, I'd love to hear back on your timing + final results. In a large pot, heat oil over medium heat and sautee onions until translucent 4-6 minutes. Add beans and quinoa to the mix and stir everything together. Let the water dry a little bit then add Simply Organic vegetarian chili seasoning and allow it to cook for 3-5 minutes. Add crushed tomatoes and low-sodium vegetarian broth to the pot and let it simmer. Add salt and pepper to taste. Mix everything and cover the pot. Cook in low-medium heat for 30 minutes if using canned beans. If using dried beans, the cooking time will vary depending on the beans and how well soaked they are. It took me for 1 hour 30 minutes to cook beans. Make sure to open the pot every 30 minutes, stir everything, and add more vegetarian broth if needed. Serve it hot with desired toppings. Cooking dried beans and timing can be tricky sometimes. If you want to use dried beans, make sure they are soaked at least overnight. If dried beans are too old, they take lot longer to cook then fresh ones. Canned beans doesn't need much cooking so your 3 Bean Quinoa Chili will be ready in 30-45 minutes, but dried beans will take upto 1 hour 30 minutes so plan accordingly. Thank you Sprouts for partnering this post.